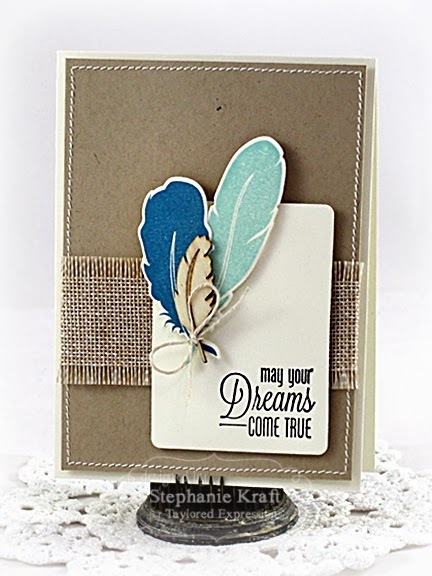 HandKrafted by Stephanie: Taylored Expressions December Sneak Peeks: Petite-a-Palooza Day 1! Taylored Expressions December Sneak Peeks: Petite-a-Palooza Day 1! Hello! Welcome to the first day of Taylored Expressions December Sneak Peeks! The Baker's Dozen is kicking off 4 days of projects (2 days of peeks, release day and a spotlight day). 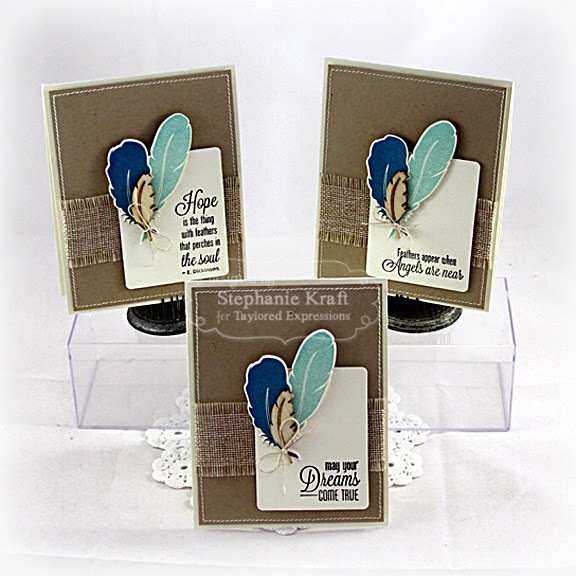 We are also celebrating our 3rd annual Petite-a-Palooza, which means that we are releasing 14 petite stamp sets with coordinating dies. Today we are featuring 7 of the new sets. All products will be released on Thursday, December 5, @ 7 AM PST. My next card uses On a Roll. This comes with 2 coordinating dies (for both skates). 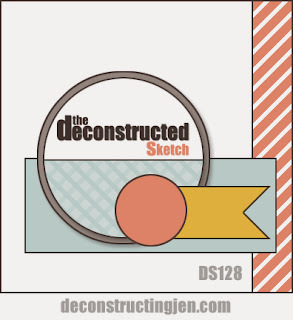 I used Jen's Deconstructed Sketch #128 for my layout. *burlap trim (linen) - 1 yd. Accessories: Taylored Dies: Light as a Feather coordinating dies, Label Stacklets 6 (TE); Burlap trim, Wood veneer feather (Studio Calico), Hemp cord, Foam tape, Thread, Sewing machine. Accessories: Taylored Dies: On a Roll coordinating dies, Banner Stacklets 1, Pinking Circle Stacklets (TE); Markers (Copic), Foam tape, Thread, Sewing machine. 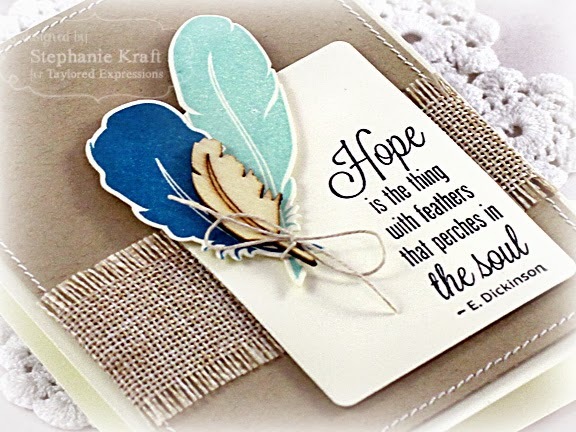 love your color combos on these two cards. 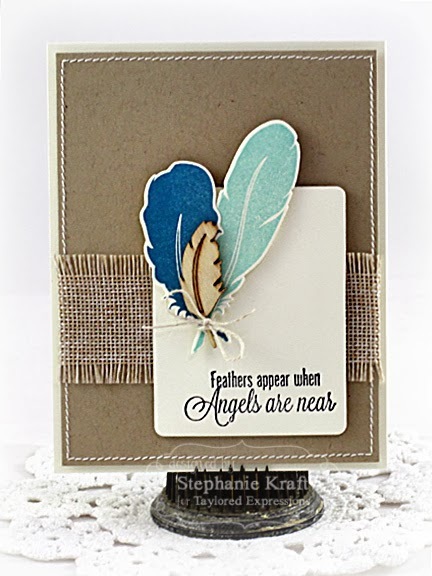 and how clever to add the wood veneer feather to the stamped images - it coordinates perfectly! 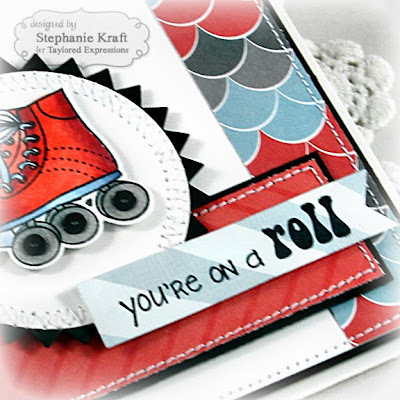 Love your feather card with the burlap and wood feather with the stamped ones, Stephanie, and how cute are those red roller skates!!!! Love the awesome sketch and perfect sewing, too!!!! 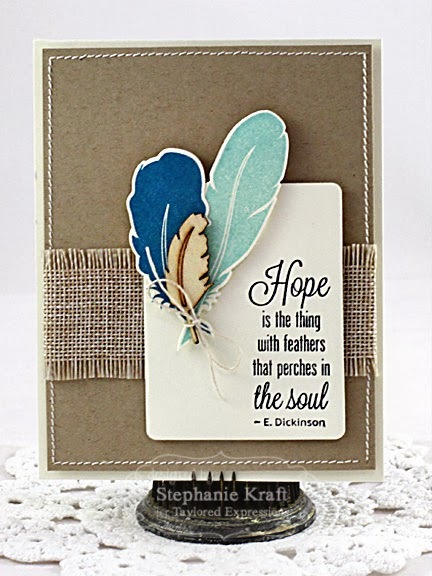 Fantastic collection of cards Stephanie! 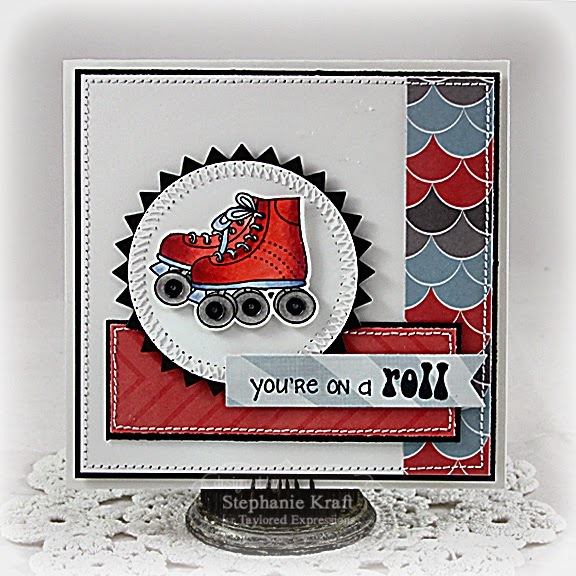 Love the pretty feathers and old fashion roller skates!